Spectacular in its beauty and scenery, isolated, untouched and unspoiled, the Bavispe River is an adventure that remains unknown to the general public. Emanating from the placid waters of Lake Angostura and its dam, the river slithers and winds its way south for dozens of miles, hugging the contours of the scenic, and extensive, box canyon that envelops it. This magical river offers visitors scenery rarely seen anywhere, with canyon walls hundreds of feet high, vertical mountain sides surrounding it, rock formations caved by the elements, terrain that is unique to the region and, together with great weather, an ecosystem full of energy and life. On its shores lies an extensive riparian habitat, full of sycamores, cottonwoods, mesquites and other such lush vegetation, helping to make the Bavispe a birding and fly-fishing paradise. Combined with shallow, calm and temperate water, with a few thrills along the way, the river allows for pleasant sightseeing, birding, camping, trekking and fishing. The Bavispe, a class one and two whitewater river, is an outdoors and nature lover’s dream, an opportunity to explore a hidden jewel, a river of impeccable natural beauty and a wonder untouched by man. 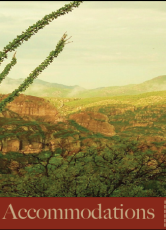 The Bavispe, a mere kilometer away from the borders of Rancho Los Baños , can be said to be one of the last remaining unspoiled rivers in the entire Sonoran and Chihuahuan desert region. In fact, access to the mouth of this body of water, which begins from the south end of Lake Angostura, lies within the property encompassing the Rancho Los Baños reserve. Its entrance is exclusive to the ranch and reserved for use only by Rancho Los Baños and its guests, making the river and its canyon, already free of people, an even more remote, private and unspoiled paradise. Rancho Los Banos also proudly offers visits to a constant guest favorite, the Hanging Gardens, a slot canyon that offers a warm springs environment with whirlpools, waterfalls and rock slides. Located in the immediate vicinity of the Bavispe River, the waters of the Hanging Gardens emanate from the slot canyon's rock walls, gushing out at various spots along the canyon and producing a crystal clear stream with a good volume of flowing water.This water, pure and warm [70-80 degrees Fahrenheit year round], comes from deep within the Earth. The environment all around the slot canyon is one of lush vegetation, giving the canyon an almost tropical feel. All around, whether on the sides of the canyon, near the water, on the water and hanging on the rock walls and cliffs, lives an abundance of vegetation that is diverse, colorful and exotic. Combining the narrow canyon walls and the thick vegetation, guests get a sense of comfort, tranquility and inner peace. Our Hanging Gardens have a Zen Garden quality about them, as if purposefully designed by man. Depending on the season, guests are invited to cool down or refresh or simply relax and bathe in the complete comfort of the Garden's whirlpools and sun-drenched rocks. Indeed, the water's,and pools', therapeutic qualities will leave you feeling energized, reinvigorated and relaxed, especially after hiking, kayaking or horseback riding for a few hours. There is a reason our Hanging Gardens are a guest favorite. They are lots of fun, a great chance to kick back, relax and soak it all in. The Gardens are a hit, not to be missed on a visit to the Rancho. Let the Garden's pools do their magic, and prepare to feel great, both physically and mentally. For fishing enthusiasts, Tierra Chamahua EcoAdventures offers excellent fly fishing along the river’s edge. You will have the opportunity to fish trout, bass and catfish in a serene and undisturbed waterway, devoid of fellow fishermen, in a setting that is unmatched. Calm pools abound here, as do tree and plant-full edges and pools. Enjoy the spectacular beauty and isolation of fishing the Bavispe River, in true calmness and tranquility. Enjoy hours fishing, contemplating life, reinvigorating your mind, and relaxing in this stress free environment. Tierra Chamahua provides all equipment, supplies and paperwork, or feel free to bring your own. Of course, for fishing enthusiasts, a Lake Angostura and Bavispe River package is available. We hope to see you soon! The Bavispe River and Rancho Los Baños await your arrival. Your river adventure is just around the corner.